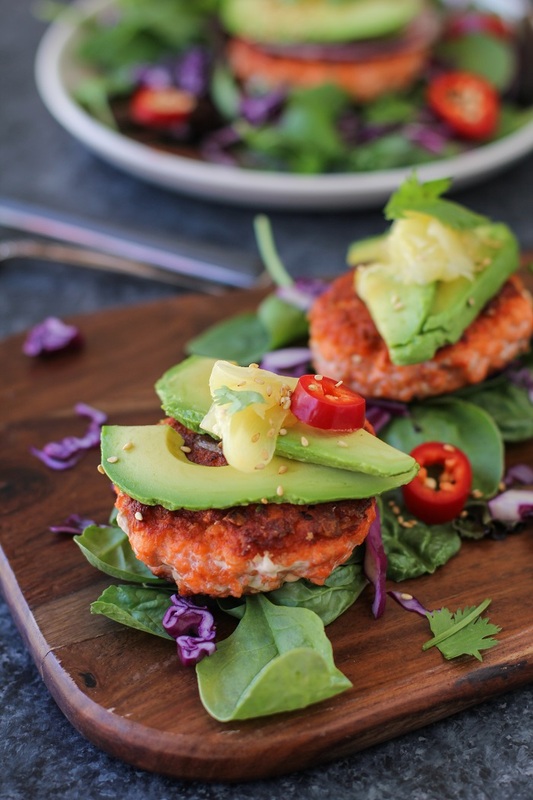 Asian salmon burgers with fresh ginger, garlic, and liquid aminos. Top the burgers with pickled ginger, avocado, and cilantro for a fresh and flavorful entree. Prior to making this recipe, salmon burgers were on my To Make list for years. I have no good excuse as to why it took me so long to make them other than I simply didn’t carve out the time. Funny though – as it turns out, salmon burgers don’t require much time at all to prepare. Now that I know how ridiculously easy and insanely tasty they are, I have my mind set on alll the salmon burgers. For instance, Greek or Mediterranean-style with sun-dried tomatoes, spinach, and olives, Jamaican spiced, Hawaiian BBQ-style with BBQ sauce and grilled pineapple, Mexican-style with a fresh n’ frisky homemade salsa, American-style with cheese and bacon…you name it, I want all the flavor combos that can be burgered. 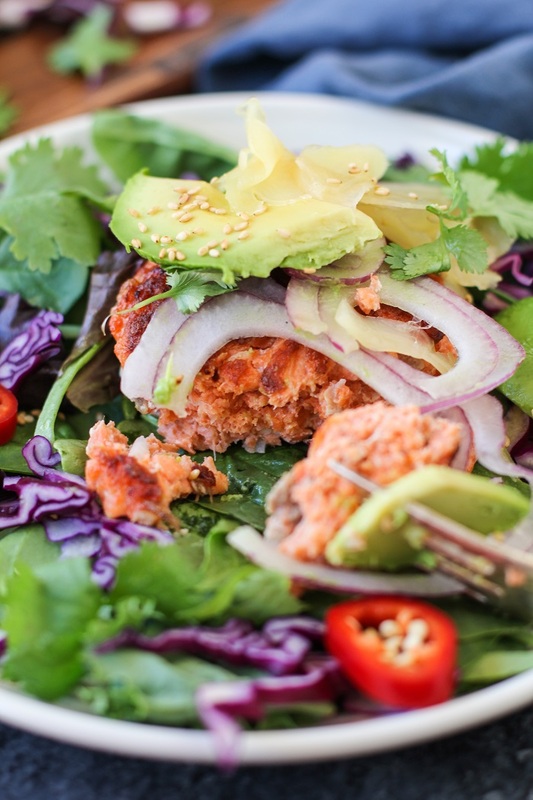 All it takes to prepare salmon burgers is buzzing up the ingredients in a food processor. 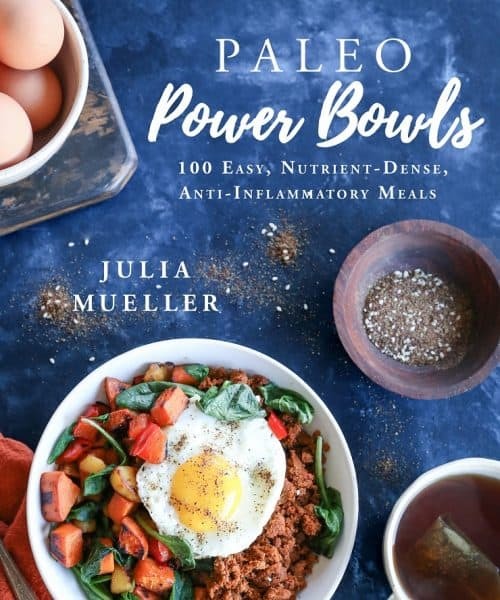 You start by chopping a skinless salmon fillet into chunks, adding it to a food processor along with the rest of the ingredients, and pulsing until everything is well-combined, leaving the mixture fairly chunky. From there, you make patties out of the mixture and cook them in a cast iron skillet. 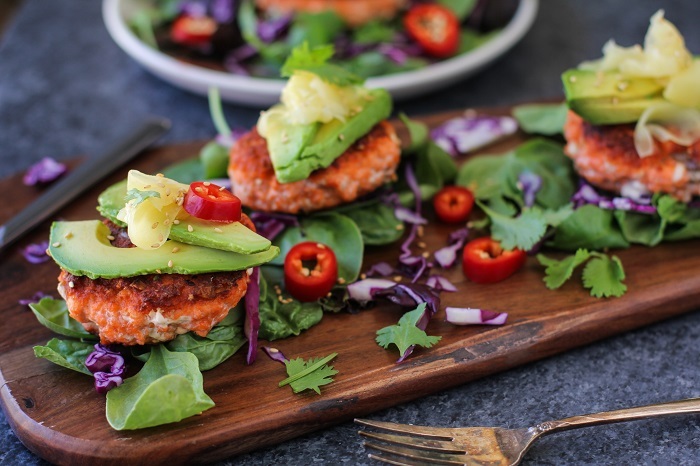 In this sense, preparing salmon burgers doesn’t require much more energy than regular burgers, and you’ll never believe how fresh they taste. For these particular burgers, I went Asian-style, using fresh ginger, garlic, and liquid aminos (you can also use soy sauce). I added a few tablespoons of gluten-free flour in order to help hold the burgers together – you can also go flourless, or add gluten-free breadcrumbs. 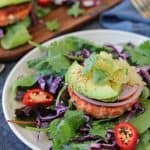 Topping the burgers with pickled ginger, avocado, and cilantro on a bed of greens kicks the experience up a notch. I used Sockeye Salmon delivered to me by Copper River Salmon for these burgers, and my gaaaawrsh, it’s just the best sockeye I’ve tried. 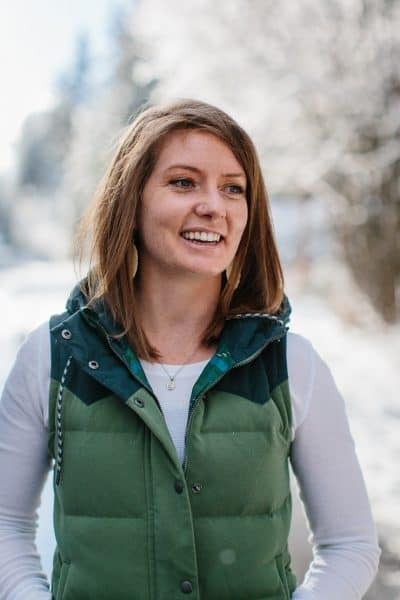 In case you’re new to Copper River Salmon, you can learn more about them from my blog posts here and here. 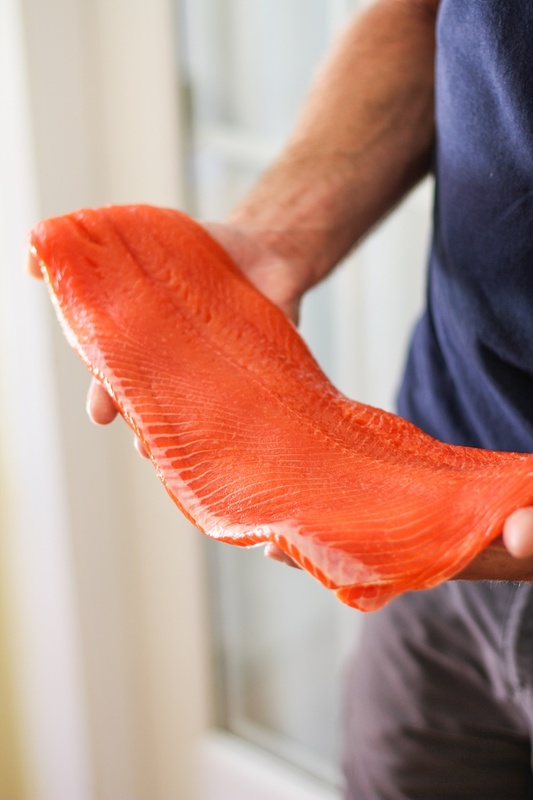 This fish was sustainably sourced from the Prince William Sound in Alaska. I’m typically much more of a king salmon fan (because: fat) than sockeye, but this fish was so fresh and unique in flavor, I’m now a true believer. You can 200% eat these burgers à la bun. If you’re a wasabi sauce lover like me, you can prepare the wasabi mayo from my Ahi Poke Sushi Bowls with Wasabi Mayo. Omit the gluten-free flour to make these burgers grain-free and paleo friendly. If you don’t need to restrict gluten from your diet, you can also use regular all-purpose flour. Add all of the ingredients for the salmon burgers to a food processor and pulse until combined, but still chunky. Avoid making a paste - you may need to stop the food processor, scrape the sides with a rubber spatula, and re-start several times. Heat 2 to 3 tablespoons over medium-high in a cast iron skillet, and form burger patties out of the salmon mixture. Once the skillet is completely hot, carefully place the salmon burgers on the hot surface. Cook for 3 minutes per side, or until burgers are golden-brown on both sides. 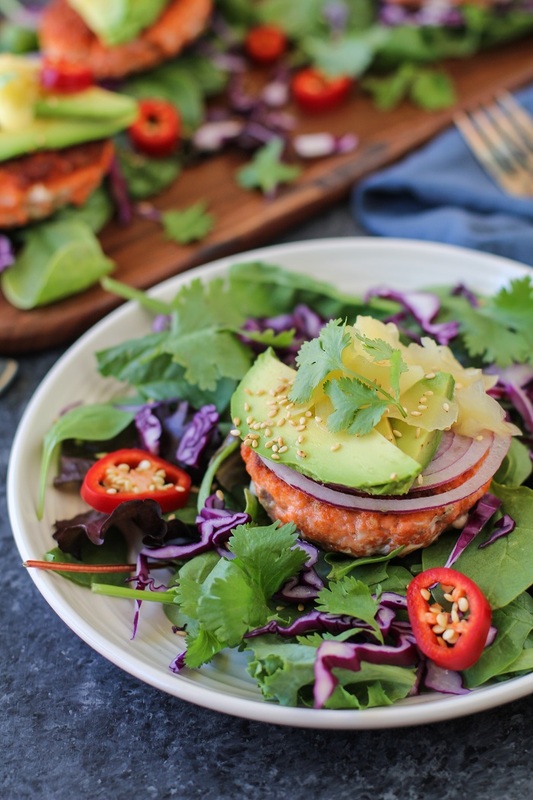 Serve salmon burgers on a bed of mixed greens with pickled ginger, red onion, avocado, and cilantro. These look amazing! I have never tried a salmon burger but now I’m really craving one. Love that avo on top! Salmon + avo is one of my favorite combos! Hope you try the recipe, m’dear! What a wonderful way to enjoy salmon! We eat it often, I bet we’d love these! Yaaas! I hope you and your family enjoy! They’re super easy and are awesome for salmon lovers! Is it just me, or do you hear these burgers screaming “eat me, Nora! !” too!? I can’t wait to try them! They’re totally screaming your name! I think you’d love them, girly! I have never tried a salmon burger but you make me want to. They are so bright and lovely! Yum! Wahoo! So happy to hear you’re inspired to try them. Let me know if you do! SALMON ANYTHING calls to me!!!! !